When it comes to the space in which we work I think there are three key factors: options for both task and mood lighting, inspired, personal surroundings and practical, comfortable furniture. Each of these three spaces have the three elements but execute them in different ways. First up, the Weathered Glam office (Mr. Bazaar's fave!) uses soft, sheer drapes and white furniture so that the character-packed beams remain the feature of the space. I love the dash of drama from the chandeliers and hot pink accents. The second space, Loft Chic, details sophisticated grey hues and pared-back furniture. Those windows bring two of the most important elements to the space: lashings of natural light and that view. The final space shows how you can use colour to add interest to a blank canvas - don't be afraid to mix old with new to bring a new twist to the scheme. Which space do you like best, folks? Will, How perfect that you posted about offices! Thanks for your comment about mine! :) My favorite is the coulourful country! I love the fresh palette and the light, airy feel! Love the first! 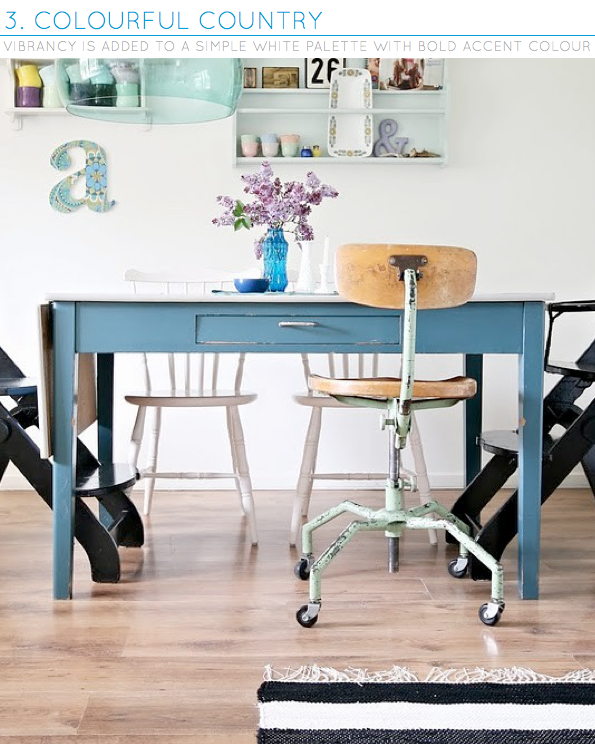 I love the inspiration/ mood wall section that adds colour- great space! Love the 3rd - from lovely An-Magritts home! i can't decide... they all have something that is special to them and that catches my eye and is lovely. wheathered glam is great, i'm a pink lover, you can always get me with a dash of it. oh my! Weathered Glam is so fantastic (and well named!) I would love to work there! @Sarah - I'll meet you at the front door! @Paper Pastries - That way you get to enjoy two styles at different times... clever idea! @Bad, the urban slant - Yes, those beams are pretty special. @Jules, Hannah, Nancy - Weathered glam gets my vote, too! @Banebakken - You are right: I like the glass and wood mix. @Rachel - I think you can actually buy pink ones like that from IKEA. They were a few seasons ago but they might still run the line! I think a new IKEA just opened in Sydney, too?! @homeboundtheheartoflife - Yes, I believe that is NYC in the background of number 2. With a view like that, who needs statement decor - the view is the statement! Beautiful rooms, I am loving number 1 and 3 the best, I wish I worked in a space like this (though granted my working space isn't too bad). Those pink lamps in #1 are awesome! @Hoola Tallulah - I think the pink lamps are from IKEA if you're after one. Oh these are all fabulous Will but I can't go past the first. Love everything about it! You know my very favorite part of Kelley's office, top? Those brilliant hot pink lamps that add the perfect splash of girly-ness to the space. Adore! I am completely in love with #2. That type of space is one of the reasons we were inpired to live in a loft. So beautiful and calm. @littletree - I'll be joining you! @Camille - I know, isn't Kelley's old Seattle office just a dream? Loved it from the moment I saw it in Rue last year! @An-Magritt - How fun that it's from your home! Thanks for stopping by; I'm hopping over to see more of your space now and I added a link to your blog! @Amanda - The view of NYC from number two gets me... soooo good! Oh, i love work spaces. That loft chic style is fabulous. Thanks fo the ideas! 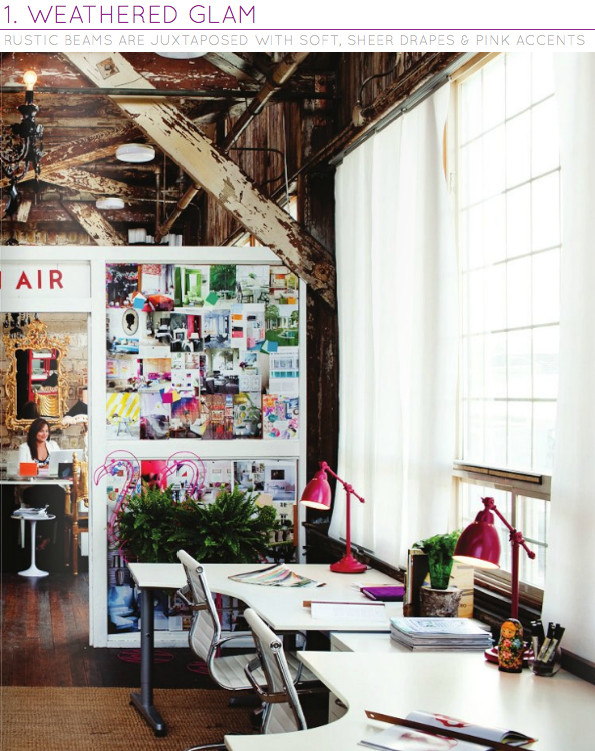 I've always loved Kelley's office in Seattle - it's got amazing style. But I'm a neutral girl through and through so I'd have to go with number two - the loft. #1! i want to share with you and sarah rhoads! we would have the best time and get into the best kind of trouble! Will!!! It's very hard! I love the first but the white of the second one calls me... May be a mix of both... white, with weathered and colorfull details... Well, would be better to have two studios??? I forgot. I love big square table for my perfect studio, like this: http://appuntidicasa.blogspot.com/2011/06/un-studio-cosi.html!!!! @Maria - Anytime. Thanks for stopping by! @Carla, Sarah - If you take one desk, I'll take the other and Sarah can have the other and we can be desk buddies in number one! @Caitlin - That loft office space is SO you. Can see it slotting straight into your SF apartment! @Oksana - I love those beams. @Jessica - I think the second space, although very light and airy, still feels welcoming because of the textures and textiles - on the chair and the rug, for example. @Vale - Mix and match and create the perfect space for you. Sounds like fun to me! These are all fabulous home offices! Visually, all of them look great! But my favorite has to be the second one. When I need to take a break from the computer, I can just look out the window and enjoy the view. these are gorgeous! I love the color in the first one. Beautiful! How about if I take the chair from 3, the desk from 2 and the inspiration board and lamps from 1. Throw in the exposed beams from 1 and the flooring and internal brickwork from 2...chuck the ceiling light in from 3 and we're in business!